Freechoice: Discover the two distinct sides of this Hungarian capital—the cobbled hills of Buda and the grand boulevards of Pest, linked by eight stately bridges that span the Danube. Climb historic Castle Hill to see the Royal Palace and Matthias Church, the stunning setting for the coronations and weddings of the Habsburg royalty. Alternatively, choose to soak in one of the city’s traditional bathhouses, or descend into the Hospital in the Rock, a secret subterranean military hospital used during World War II. If you wish, set out on a guided walk in the Buda hills, hiking up to Lions Rock. Freechoice: Choose from among several excursions today. Bike between Vienna’s magnificent palaces, parks, and cathedrals on a guided cycling tour; or tour the Schönbrunn Palace, the baroque summer residence of the imperial family and a World Heritage site. You may instead choose to take a guided tour of the Museum of Natural History for an inside look at its meteorite exhibit, curated by a National Geographic grantee. Alternatively, visit Bratislava for a guided tour through the cobbled streets of the old town. Freechoice: Glide into Austria’s lush Wachau Valley and dock at Melk for a tour of its Benedictine abbey, one of the world’s most magnificent baroque buildings. 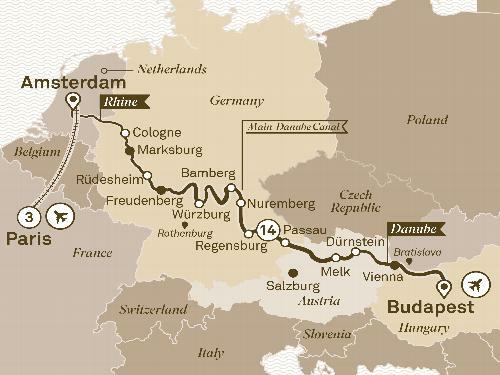 Or take a more active excursion, cycling along the Danube from Dürnstein to Melk or hiking to the hilltop ruins of a medieval castle. Or visit a local winery for a guided tour of the cellars and vines, followed by a tasting of the region’s celebrated Grüner Veltliners and Rieslings. Spend the day in Salzburg, a baroque beauty brimming with old-world European charm. Take in views of wildflower-dotted meadows and snow-capped Alpine peaks and stroll the storybook streets of the old town, lined with lively shops and cafés. Salzburg features prominently in the celebrated 1965 movie The Sound of Music, and we’ll see the film come to life during an exclusive music and dance show with fantastic sets performed in the rolling hills above Salzburg. Enjoy a traditional Austrian lunch as you hum along to the movie’s beloved classics. Freechoice: A World Heritage site set at the confluence of the Danube, Naab, and Regen rivers, Regensburg once served as a free imperial city of the Holy Roman Empire. On a guided visit, venture into the medieval center to see its splendid Gothic cathedral, 12th-century stone bridge, and the Porta Praetoria—the ancient Roman city gate. Alternatively, tour the historic Kuchlbauer Brewery and its whimsical tower—a tribute to modern art. Or take a local ferry across the Danube Gorge to Weltenburg Abbey, home to the world’s oldest monastic brewery. Explore the abbey, then head to the courtyard and sip on a pint of their popular Weltenburger Kloster Barock Dunkel. If you wish, join a biking tour to Walhalla, a hall of fame of famous Germans honoring artists, politicians, scientists and more. Threaded by medieval walls, crammed with half-timbered houses, and overlooked by an imperial castle, Nuremburg enjoys an abundance of charms—thanks in part to the meticulous reconstruction of the historic center following wartime devastation. The city also played center stage for German propaganda in the years leading up to World War II, and was the site of the historic trials where Nazi war criminals were brought to justice. Freechoice: Explore Würzburg, a city set at the junction of two ancient trade routes, and enjoy a guided tour of its 18th-century Residenz—one of Germany’s most magnificent baroque buildings and a World Heritage site. Or take a ride along the Romantic Road, winding through bucolic scenery and red-roofed towns en route to the postcard-perfect Rothenburg ob der Tauber. Walk the town’s medieval ramparts and snap photos of its sherbet-shaded houses before returning to Würzburg. Ride into Rüdesheim on the Winzerexpress mini-train set out to explore the city or the surrounding Rheingau wine region. Enjoy a guided visit to Siegfried’s Mechanical Music Cabinet, home to elaborate self-playing musical instruments. Then get a bird’s-eye view of the Rhine on a cable car ride to the Niederwald Monument—built to commemorate the 1871 unification of Germany. Or set out on a hike amid the vineyards of the Middle Rhine Valley, another World Heritage-designated region. Cruise through the Middle Rhine Valley to Cologne, a hub for visual arts and an architectural mosaic of Romanesque churches, modernist museums, and Gothic spires. With its gabled roofs, squares cluttered with bicycles, and canal-lined streets, Amsterdam is bursting with unique character. Freechoice: Explore Paris on a guided tour or marvel at the incredible exhibits at the Louvre museum. Alternatively, let a local Parisian show you another side of the city. You have a free day so explore to your heart’s content.